Card, S.K, Moran, T.P., Newell, A. (1983). The psychology of human-computer interaction. L. Erlbaum, Hillsdale, New Jersey. Nielsen, J. (1990). Hypertext and Hypermedia. Academic Press, San Diego. Reviews the features and applications of a broad range of computer software systems that allow the user to choose the sequence of text or other display at the time of use. Rasmussen, J., Andersen, H. B. (1992). Human-Computer Interaction (Research Directions in Cognitive Science. European Perspectives, Vol 3). Taylor & Francis. 232 pages. Tognazzini, B. (1992). Tog on Interface. Pearson Education Canada. 352 Pages. Explores the central issues of user interface design, including the problems presented by multimedia applications. It is a unique treasury of ideas and opinions from one of the key thinkers in the industry. It will be required and fascinating reading for all those concerned with the relationship between computers and people. "Tog's book is a must-read. It's chock-full of intuitive insights and practical technical examples. My favorite story is why people walk into their furniture after going on camping trips. You'll have to read the book to find out the reason!" - Roger von Oech, Author. Baecker, R.M. (1992). Readings in groupware and computer-supported cooperative work : Assisting human-computer collaboration. Morgan & Kaufmann, San Francisco, CA. 231 pages. This comprehensive introduction to the field represents the best of the published literature on groupware and computer-supported cooperative work (CSCW). The papers were chosen for their breadth of coverage of the field, their clarity of expression and presentation, their excellence in terms of technical innovation or behavioral insight, their historical significance, and their utility as sources for further reading. Taken as a whole, the papers and their introductions are a complete sourcebook to the field. Nielsen, J. (1993). Usability Engineering. Academic, Cambridge, MA. Written by the author of the best-selling HyperText & HyperMedia, this book is an excellent guide to the methods of usability engineering. The book provides the tools needed to avoid usability surprises and improve product quality. Step-by-step information on which method to use at various stages during the development lifecycle are included, along with detailed information on how to run a usability test and the unique issues relating to international usability. Today's increasingly competitive and fiscally constrained business environment is fostering the need to cut costs and justify expenditures. Usability engineering is not yet universally accepted, nor is it yet an integrated aspect of software engineering, and would-be usability champions need more help than ever to win the funding necessary to introduce and promote usability engineering techniques. Rubin, J. (1994). Handbook of Usability Testing: How to Plan, Design, and Conduct Effective Tests. John Wiley & Sons Canada, Limited. Presents a step-by-step approach to usability testing in today's fast-paced industrial production environment, where reducing time to market has become a prerequisite for survival. Contains chapter coverage for each of the six stages including numerous examples and case studies. Provides information on the politics and human elements of testing within an organization. Features plenty of inside tips and tricks to help ease the testing process. del Galdo, E. M., Nielsen, J. (1996). International User Interfaces. John Wiley & Sons Canada, Ltd. 288 pages. With the world continuing to shrink into a "global village," software companies are working to make programs that transcend language and cultural borders. One such way is through international user interfaces where the software is prepared so that it can be easily localized in each country. This book focuses on user interfaces, exploring what they can do, and what they need to do to become commercially viable. Bailey, R.W. (1996). Human performance engineering. Designing high quality professional user interfaces for computer products. Applications and Systems. Upper Saddle River, New Jersey: PTR Prentice Hall. 636 pages. Introducing a proven user interface design model for the design and development of high-quality user interfaces, this new edition is a professional guide to designing traditional graphical user interfaces (GUIs) and object- oriented graphical user interfaces, plus high-quality character-based interfaces, and state- of-the-art multimedia user interfaces. Covers prototyping and usability testing; multimedia user interfaces, including discussions of sound, high- resolution images, and full-motion video; task analysis; the three most popular statistical methods; and documentation and training issues. For user interface specialists, programmers, systems analysts, system designers, project leaders, and system engineers. Mandel, T. (1997). The Elements of User Interface Design. Wiley. 464 pages. The Elements of User Interface Design is written by a cognitive psychologist and interface design specialist with more than a decade's research and design experience. Writing for novices and veteran developers and designers alike, Dr. Mandel takes you from command-line interfaces and graphical-user interfaces (GUIs) to object-oriented user interfaces (OOUIs) and cutting-edge interface technologies and techniques. Throughout, coverage is liberally supplemented with screen shots, real-life case studies, and vignettes that bring interface design principles to life. Task analysis is an important aspect of user interface design, insuring that the end product is usable and practical. Written by task analysis experts, this book is the first book that provides full-length coverage of task analysis. It covers in detail every step of the task analysis process, and discusses the methodologies behind it. Olsen, D. (1998). Developing user interfaces. Morgan & Kaufmann, San Francisco, CA. 414 pages. Developing User Interfaces is targeted at the programmer who will actually implement, rather than design, the user interface. Most user interface books focus on psychology and usability, not programming techniques. This book recognizes the need for programmers to collaborate with usability experts and psychologists, so topics such as the principles of visualization, human perception, and usability evaluation are touched upon. Yet the primary focus remains on those tools and techniques required for programming the complex user interface. Focuses on advanced programming topics event handling interaction with geometric objects widget tool kits input syntax Useful to programmers using any language-no particular windowing system or tool kit is presumed, examples are drawn from a variety of commercial systems, and code examples are presented in pseudo code The basic concepts of traditional computer graphics such as drawing and three-dimensional modeling are covered for readers without a computer graphics background. Top-notch support for cooperative software activities. Since CSCW systems are distributed and often require near real-time response capabilities over wide area networks, CSCWs must be fault-tolerant and have the capacity to run in heterogeneous environments. This book addresses these challenges, addressing groupware, shared editing, mediaspaces, coordination and integrated tools, and formal methods. Mayhew, D.J. (1999). The Usability Engineering Lifecycle: A Practitioner's Handbook for User Interface Design. Morgan Kaufmann, San Francisco, CA. 542 pages. This book is about achieving usability in product user interface design through a process called Usability Engineering. Usability Engineering techniques presented include not only UI requirements analysis, design and evaluation techniques, but also organizational and managerial strategies. The book is organized around a typical project lifecycle, and presents usability engineering techniques, which can be applied at different points in the development process. Nielsen, J. (1999). Designing Web Usability: The Practice of Simplicity. New Riders Press. Indianapolis. One of the biggest problems facing Web designers is how to get users to absorb content. Designing Web Usability: The Practice of Simplicity is a tutorial and exposition of the principles of design that help bring the user to the content in an effective and efficient way. It features new approaches for crafting effective sites through logical and strategic presentation. It aids users in building Web sites that stand out from the noise of the Internet with clarity and purpose. Done up in full-colour with practical examples and critiques, it will make your site an effective communicator. Druin, A. (1999). The Design of Children's Technology: How We Design, What We Design and Why. Morgan Kaufmann. The creation of computer technologies for children is a multidisciplinary process whose techniques and functions are growing increasingly important. This contributed work will discuss how and why new technologies are being designed, introduce the diversity of approaches that university researchers use in their research methodologies, and explain the range of technologies being created today for children. Dumas, J., Redish, J. (1999). A Practical Guide to Usability Testing. Revised Edition, Intellect. 404 pages. Written in plain English and filled with examples, the book begins by defining usability and explaining methods of usability engineering. Readers are taken through all the steps for planning and conducting a usability test, analysing data, and using the results to improve both products and processes. Included are forms that can be used or modified to conduct a usability test, and layouts of existing labs that will help readers to build their own. Benyon, D. (1999). Conceptual Modeling for User Interface Development. Springer-Verlag New York. 200 pages. Conceptual Modeling for User Interface Development introduces the technique of Entity-Relationship-Modeling and shows how the technique can be applied to interface issues. It explains those aspects of entity-relationship modeling which are relevant to ERMIAs, and it presents the extensions to the notation that are necessary for modeling interfaces. This book is aimed at both interface designers and software developers in an attempt to bridge the gap in the development of interactive systems. Too often, when software is being developed, the software engineers do not sufficiently consider how easy the system will be to learn and use. On the other side, interface specialists tend to express their concerns in ways which are either too detailed to be readily understood or in ways which are difficult for the software developer to implement. ERMIA provides a set of concepts which can be used equally easily by software developers and interface designers alike. Carroll, J.M. (2000). Making Use: Scenario-Based Design of Human-Computer Interactions. The MIT Press. 382 pages. Traditional textbook approaches manage the complexity of the design process via abstraction, treating design problems as if they were composites of puzzles. Scenario-based design uses concretization. Scenarios are a vocabulary for coordinating the central tasks of system development--understanding people's needs, envisioning new activities and technologies, designing effective systems and software, and drawing general lessons from systems as they are developed and used. Instead of designing software by listing requirements, functions, and code modules, the designer focuses first on the activities that need to be supported and then allows descriptions of those activities to drive everything else. In Don�t Make Me Think, usability expert Steve Krug distills his years of experience and observation into clear, practical and often amusing common sense advice for the people in the trenches (the designers, programmers, writers, editors, and Webmasters), the people who tell them what to do (project managers, business planners, and marketing people), and even the people who sign the checks. Bergman, E. (Ed.) (2000). Information appliances and beyond. Interaction design for consumer products. Morgan & Kaufmann, San Francisco, CA. Information appliances and other interactive products "beyond the desktop" present user interface design challenges that are only beginning to be understood. In this one-of-a-kind book, interaction designers examine the issues they confronted in their projects: Microsoft Windows CE, a vehicle navigation system, interactive children's toys, and more. You'll enjoy reading their engaging and sometimes surprising stories, but more importantly you'll gain insights that will benefit your own design and development work. Raskin, J. (2000). The humane interface. New directions for designing interactive systems. ACM Press. This unique guide to interactive system design reflects the experience and vision of Jef Raskin, the creator of the Apple Macintosh project. Other books may show how to use today's widgets and interface ideas effectively. Raskin, however, demonstrates that many current interface paradigms are dead ends, and that to make computers significantly easier to use requires new approaches. He explains how to effect desperately needed changes, offering a wealth of innovative and specific interface ideas for software designers, developers, and product managers. Preece, J. (2000). Online Communities: Designing Usability and Supporting Sociability. John Wiley & Sons. 464 pages. The purpose of the book is to set up a framework for discussions on social and technical issues of online communities. Designing usability and supporting sociability lays a solid foundation on which online communities can grow and thrive. Intended for both students and computer professionals, the book addresses the development of new online communities as well as the improvement of existing ones. It is divided into two parts - Getting Acquainted with Online Communities and Developing Online Communities - along with a preface and a concluding chapter which explores the future of online communities. McGrath, M. E. (2000). Product Strategy for High Technology Companies. Professional Books. 320 pages. One of the key determinants of success for today's high-technology companies is product strategy-;and this guide continues to be the only book on product strategy written specifically for the 21st century high-tech industry. More than 250 examples from technological leaders including IBM, Compaq, and Apple-;plus a new focus on growth strategies and on Internet businesses-;define how high-tech companies can use product strategy and product platform strategy for competitiveness, profitability, and growth in the Internet age. Johnson, J. (2000). GUI Bloopers: Don'ts and Do's for Software Developers and Web Designers. Morgan Kaufmann Publishers. GUI Bloopers looks at user interface design bloopers from commercial software, Web sites, and information appliances, explaining how intelligent, well-intentioned professionals made these dreadful mistakes--and how you can avoid them. While equipping you with all the theory needed to learn from these examples, GUI expert Jeff Johnson also presents the reality of interface design in an entertaining, anecdotal, and instructive way. This is an excellent, well-illustrated resource for anyone whose work touches on usability issues, including software engineers, Web site designers, managers of development processes, QA professionals, and usability professionals. Dertouzos, M. L. (2001). The unfinished revolution: Human-centered computers and what they can do for us. HarperBusiness. 225 pages. The Unfinished Revolution is nothing less than an inspired manifesto for the future of computing. Dertouzos's vision will change how businesses, organizations, and governments work with each other, and how individuals interact. It represents the dawn of a new era in information technology. Stephanidis, C. (Ed.) (2001). User interfaces for all: Concepts, methods, and tools. Lawrence Erbaum Associates. 728 pages. Advocating a concept called "universal design" (or "design for all"), this volume calls for an "inclusive and proactive" approach seeking to accommodate diversity in the users and usage contexts of interactive products, applications, and services, starting with the design phase of the development life-cycle. Contributors to the volume's 30 chapters describe various aspects of this approach, including the scientific, technical, technological, socioeconomic, and policy issues involved in the attainment of universal access when developing interactive software. Nielsen, J. (Ed.) (2001). Coordinating user interfaces for consistency. Morgan Kaufmann. 152 pages. In these contributed chapters, you'll find details on many methods for seeking and enforcing consistency, along with bottom-line analyses of its benefits and some warnings about its possible dangers. Most of what you'll learn applies equally to hardware and software development, and all of it holds real benefits for both your organization and your users. Rosson, M.B., Carroll, J.M. (2001). Usability Engineering: Scenario-Based Development of Human-Computer Interaction. Morgan Kaufmann, San Francisco. 422 pages. Usability Engineering: Scenario-Based Development of Human-Computer Interaction is a radical departure from traditional books that emphasize theory and address experts. This book focuses on the realities of product development, showing how user interaction scenarios can make usability practices an integral part of interactive system development. As you'll learn, usability engineering is not the application of inflexible rules; it's a process of analysis, prototyping, and problem solving in which you evaluate tradeoffs, make reasoned decisions, and maximize the overall value of your product. Preece, J., Rogers, Y., Sharp, H. (2002). Interaction Design: Beyond Human-computer interaction. John Wiley & Sons Canada. 544 pages. Accomplished authors, Preece, Rogers and Sharp, have written a key new textbook on this core subject area. Interaction Design deals with a broad scope of issues, topics and paradigms that has traditionally been the scope of Human-Computer Interaction (HCI) and Interaction Design (ID). The book covers psychological and social aspects of users, interaction styles, user requirements, design approaches, usability and evaluation, traditional and future interface paradigms and the role of theory in informing design. The topics will be grounded in the design process and the aim is to present relevant issues in an integrated and coherent way, rather than assembling a collection of chapters on individual HCI topics. As the mobile telephone market reaches saturation and PDA�s become cheaper, soon everyone will have a small, wireless device with which they will be able to do more than just make telephone calls or keep diaries and address books. This book is a handbook to usability testing and information architecture for EPOC, WAP, PDA�s, handhelds, and handsets, which provides an overview of the medium and then details medium-specific issues and design strategies. Norman, D.A. (2002). The Design of Everyday Things. HarperCollins Canada / Basic Books. 272 pages. Anyone who designs anything to be used by humans--from physical objects to computer programs to conceptual tools--must read this book, and it is an equally tremendous read for anyone who has to use anything created by another human. It could forever change how you experience and interact with your physical surroundings, open your eyes to the perversity of bad design and the desirability of good design, and raise your expectations about how things should be designed. Carroll, J.M. (Ed.) (2002). Human-Computer Interaction in the new Millennium. Addison-Wesley, Boston. 703 pages. Twenty-nine papers, 15 of them first published in special issues of the journals ACM transactions on computer-human interaction and Human-computer interactions, make up this assessment of the state of HCI at the turn of a new century. Sections are concerned with models, theories, and frameworks; usability engineering methods and concepts; user interface software and tools; groupware and cooperative activity; media and information; integrating computation and real environments; and HCI and society. Shneiderman, B. (2003). Leonardo's laptop. Human needs and the new computing technologies. The MIT Press, Cambridge, MA. 288 pages. Ben Shneiderman's book dramatically raises computer users' expectations of what they should get from technology. He opens their eyes to new possibilities and invites them to think freshly about future technology. He challenges developers to build products that better support human needs and that are usable at any bandwidth. Shneiderman proposes Leonardo da Vinci as an inspirational muse for the "new computing." He wonders how Leonardo would use a laptop and what applications he would create. Carroll, J.M. (2003). HCI Models, Theories, and Frameworks : Toward a Multidisciplinary Science. Morgan Kaufmann Series in Interactive Technologies. 576 pages. HCI Models, Theories, and Frameworks fills a huge void in the education and training of advanced HCI students. Its authors comprise a veritable house of diamonds-internationally known HCI researchers, every one of whom has successfully applied a unique scientific method to solve practical problems. Each chapter focuses on a different scientific analysis or approach, but all in an identical format, especially designed to facilitate comparison of the various models. Cooper, A. and Reimann, R. (2003). About Face 2.0: The Essentials of Interaction Design. John Wiley & Sons Canada. This is the first book and aspiring developer should read. It is also the next book they should read. After they get that big-bucks job and are writing code for a living ... read it again. When you finish a project, that would be a good time to pickup the book and see what of it applies to your "complete" software project. Alan has an engaging, no-nonsense style that is uniquely his. Like his first About Face and The Inmates Are Running the Asylum, this book is loaded with sage advice. Bederson, B. B., Shneiderman, B. (Eds.) (2003). The Craft of Information Visualization: Readings and Reflections. San Francisco: Morgan Kaufman. 450 pages. Information visualization is a rapidly growing field that has emerged from research in human-computer interaction, computer science, graphics, visual design, psychology, and business methods. It is becoming an increasingly critical component in scientific research, digital libraries, data mining, financial analysis, market studies, manufacturing production control, and drug discovery. The Craft of Information Visualization: Readings and Reflections traces the evolution of ideas and innovations within a leading research lab. It collects for the first time 38 of the key papers from the University of Maryland's Human-Computer Interaction Lab (HCIL), a respected community that has shared many scientific and commercial successes. Nogier, J.F. (2003). Ergonomie du logiciel et Design web. Dunod - 01 Informatique. 267 pages. D�lib�r�ment pragmatique, cet ouvrage fait la synth�se des recommandations et des exp�riences men�es dans le domaine de l'ergonomie du logiciel et des sites internet. Du choix des couleurs et des polices de caract�res � l'organisation des composants de l'interface, de la conception du protocole de navigation d'un site internet aux sp�cificit�s graphiques d'une page web, il propose des m�thodes et donne des conseils pratiques pour rendre le dialogue homme-machine le plus simple, le plus fluide et le plus efficace possible. Mueller, J. (2003). Accessibility for Everybody: Understanding the Section 508 Accessibility Requirements: Understanding the Section 508 Accessibility Requirements. Springer-Verlag New York. 528 pages. Text provides an overview of the Section 508 Accessibility Requirements. Includes chapters such as What is Section 508 Accessibility? ; Understanding Section 508 Requirements; Hardware, Resources, and Training; Developer Guidelines that Make Sense; Desktop Application Essentials; and Using Microsoft Active Accessibility. For software application developers. McCracken, D. D., Wolfe, R. J., Spool, J. M. (2003). User-Centered Web Site Development: A Human-Computer Interaction Approach. Prentice Hall. 336 pages. This book that introduces the reader to the human component of Web site design. Readers will be able to do a much better job of writing front ends or other interactive software, as the book describes the creation of user-friendly Web sites. In the context of Human-Computer Interaction and Web design, this book covers such topics as user and task analysis, content organization, visual organization, navigation design, prototyping, and evaluation, as well as color, typography, multimedia, bandwidth and file compression, accessibility, globalization and future trends. Diaper, D., & Stanton, N. A. (Eds.) (2004). The handbook of task analysis for human-computer interaction. Mahwah, NJ: Lawrence Erbaum Associates. 650 pages. 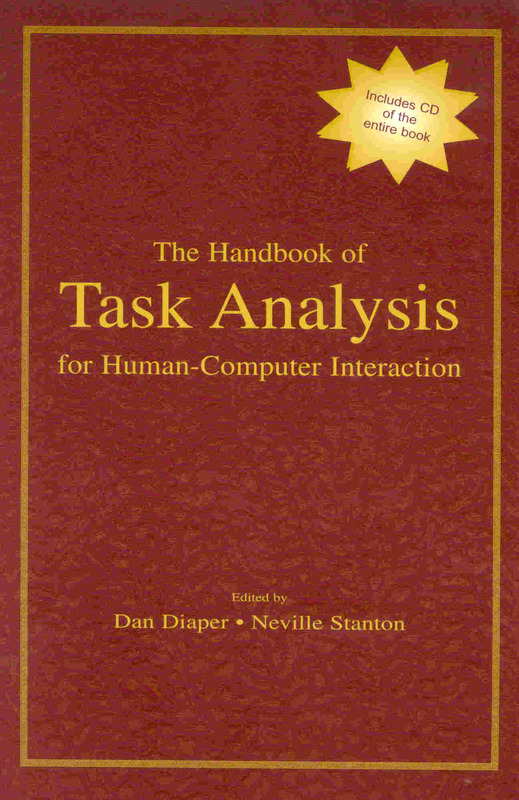 The most widely cited reference on task analysis has been Task-Analysis for Human-Computer Interaction ,edited by Dan Diaper, who must take the main blame for this new Handbook of Task Analysis for Human-Computer Interaction ,as his motive was in part to stem the trickle of requests from around the world for chapters from the out-of-print 1989 book. We, the editors, wanted to produce the definitive reference on task analysis for human-computer interaction (HCI). In this we have failed, and the new handbook provides merely a comprehensive sample of the current research on and use of task analysis. Gay, G., & Hembrooke, H. (2004). Activity-centered design: An ecological approach to designing smart tools and usable systems. Cambridge, MA: The MIT Press. 144 pages. In Activity- Centered Design Geri Gay and Helene Hembrooke argue that it is time to develop new models for HCI design that support not only research and development but also investigations into the context and motivation of user behavior. Gay and Hembrooke examine the ongoing interaction of computer systems use, design practice, and design evaluation, using the concepts of activity theory and related methods as a theoretical framework. Norman, D.A. (2004). Emotional design: Why we love (or hate) everyday things. New York, NY: Basic Books. 256 pages. By the author of The Design of Everyday Things, the first book to make the connection between our emotions and how we relate to ordinary objects-from juicers to Jaguars. New research on emotion and cognition has shown that attractive things really do work better, a fact fans of Don Norman's classic The Design of Everyday Things cannot afford to ignore. Cohen, M. H., Giangola, J. P., Balogh , J. (2004). Voice User Interface Design. Addison-Wesley Professional. 368 pages. Perhaps the most critical factor in the success of any automated speech recognition system, the design of the voice user interface (VUI) often determines whether the user experience will be satisfying or frustrating. This practical guide for industry professionals presents a method for creating an effective VUI design. Sample topics include creating a "persona" for the interface, minimizing cognitive load, and working with voice actors. The authors are affiliated with Nuance Communications. Schaffer, E. (2004). Institutionalization of Usability: A Step-by-Step Guide. Addison-Wesley Professional. 304 pages. This book is a guide to making usability a routine practice within an enterprise, be it commercial or government. Every organization has special needs: There is no one simple approach that fits all organizations. What this book provides, however, is a solid methodology, not for usability engineering (that's been done before and exists in various forms), but for the part that is truly missing--the institutionalization of usability. This institutionalization methodology is not new. It is simply a synthesis of the best practices and insights from hundreds of companies in the forefront of this effort. Copyright (c) 2002-2009 Ergonaute Consulting. All rights reserved.